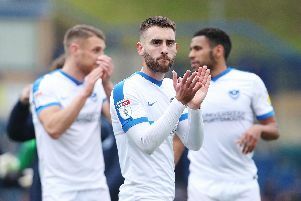 The head of the maternity service at QA says she and her colleagues are overjoyed that Pompey midfielder Dion Donohue’s family made a full recovery after a traumatic childbirth. As reported, Dion’s girlfriend Nadine lost a lot of blood during the birth and son Mason did not breathe for five minutes after being delivered. Fortunately the pair recovered well and Dion praised the maternity unit staff at QA who cared for them. Today Abbie Aplin, the interim director of midwifery and maternity at Portsmouth Hospitals NHS Trust, said: ‘The Trust Maternity Services and the Neonatal Team would like to thank Dion, Nadine and Mason for their kind expression of thanks. ‘Childbirth can be very unpredictable and whilst the majority of births are uncomplicated there are a number of women who experience complications as described by Dion. ‘The midwives and obstetricians who cared for Nadine and the neonatologists who looked after Mason undertake extensive multidisciplinary training in birth emergencies so that they are prepared and drilled to respond to complications for mothers and babies.